Welcome on June 6,2010 from 12 to 4 pm. 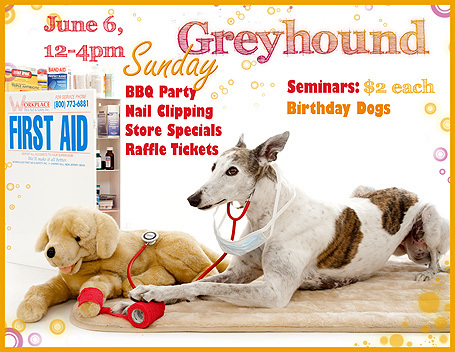 Bring your greyhounds and join us for a fun-filled afternoon. This two-part presentation will first emphasize how NOT to become a member of the Runaway Dog Club. Tricia will also discuss the importance of a first 24-hour recovery plan and will go over the contents of a lost dog box - something every dog owner should have! Learn how your dog can become a therapy dog, including the requirements of several major national therapy dog groups and also Canine Good Citizen. Enjoy hearing about the different jobs therapy dogs have. Sami will share with you the National Institute of Health Institutional Review Board's approved research study that she and her greyhound Gypsy developed which focuses on the impact a therapy dog has on patients. Summertime means more time spent outdoors with your pet and more chances for injuries and mishaps. Find out what basic items you should have available to handle a pet emergency. Samantha and Erin will demonstrate pet CPR, checking vital signs and basic first aid. All greyhounds having June or July birthdays will get special recognition. We will be grilling Cheeseburgers and Italian Sausages. Assorted salads and desserts will also be available. Bring a blanket and enjoy some lunch in the grass under our shady trees! Donations are appreciated to offset the cost of the food. 2010 Picnic Raffle - GO FLYERS!!! Although our new greyhound kennel is finished and full of happy greyhounds, we still have much to do before our state-of-the-art surgical facility is completed and open for business. All monies from this raffle will go directly towards the completion of that project! Three names will be drawn. First Place Winner Gets Their Choice of: Authentic 2003/2004 Team Autographed Flyers Jersey OR L'Oreal Gift Basket Valued at over $500 OR 'Jeweled Devotion' Lenox Greyhounds.